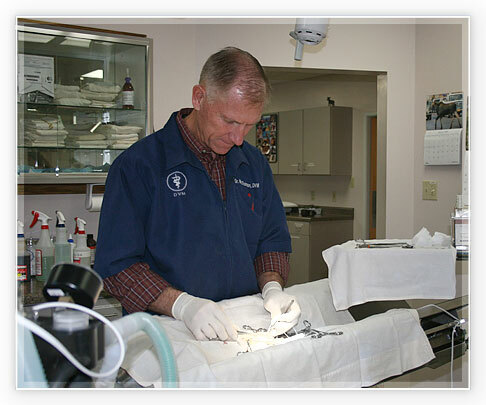 We provide surgery for dogs and cats. We know that the decision to allow your beloved companion to undergo surgery is never an easy one, so we strive to ensure your pet's procedure is comfortable and that your experience is as stress free as possible. The most important pre-surgical step we take is to discuss with you why we believe a particular procedure is necessary and what it entails. We provide detailed information on proper postoperative care and answer all questions you may have so that you feel comfortable knowing you're making the right choice for your pet. The reason we offer as wide an array of surgical services from our facility as possible is so that you and your pet receive care in a friendly and welcoming facility from people you have come to know. This friendly, practical and safe approach reduces stress and promotes healing. We encourage our clients to bring their pets to the clinic in the afternoon or evening prior to surgery so that we may perform a comprehensive examination, fast the pet, and perform pre-anesthetic blood testing to identify any potential risk prior to the procedure, if necessary. All surgical patients must have a current physical exam that assesses physical condition and to determine the current vaccination status prior to surgery. While many pets undergoing surgery return home the same day, we feel that feline declaws and pets with more invasive surgeries benefit from an extended rest to prevent post-operative complications from over-exertion if they return home too soon. General surgery services include spays, neuters, soft tissue surgeries and foreign body removals. We recommend spaying your pet at about five months of age or before the first heat cycle. A female pet that has been spayed experiences fewer health issues over her life. Besides repeated heat cycles, a female pet that is not spayed has higher hormone levels that are linked to an increased risk of developing mammary tumors, ovarian cysts and uterine infections. There are both medical and behavioral advantages to neutering your male pet at about five months of age. Neutering decreases your dog's risk of developing tumors, hernias and prostate problems. Neutering reduces urinary spraying and reduces the risk of testicular cancer and prostate problems in most male cats. All pets under the age of 7 that are undergoing surgery are given the option of intravenous fluids to maintain blood pressure during the surgical procedure. Intravenous fluids are required for those patients who are seven years or older. Pre-anesthetic blood work is also recommended before each anesthetic procedure to provide us with information about organ function and screens for diseases, even if the pet is asymptomatic. We use multiple methods of monitoring anesthesia to ensure your pet's safety and comfort. Sedatives and pain medications are administered during and after surgery to minimize stress and pain. After surgery we closely monitor all animals to ensure their comfort and safe recovery. Should we recommend that more extensive surgery is required, we may refer you to a board certified veterinary specialist.